The JPA Bursary Programme is open to students who have completed their pre-university examinations (the STPM or A-Levels) while the JPA Scholarship Programme is for SPM leavers. Najib said scholarships will also be given to 8,000 students pursuing their undergraduate degrees locally. Only 200 students will receive scholarships to study engineering degrees in Japan, South Korea, Germany and France, he said in his speech when announcing the 2016 Budget revision in Putrajaya. However, the top 20 SPM scorers will receive scholarships to study anywhere in the world, he added. 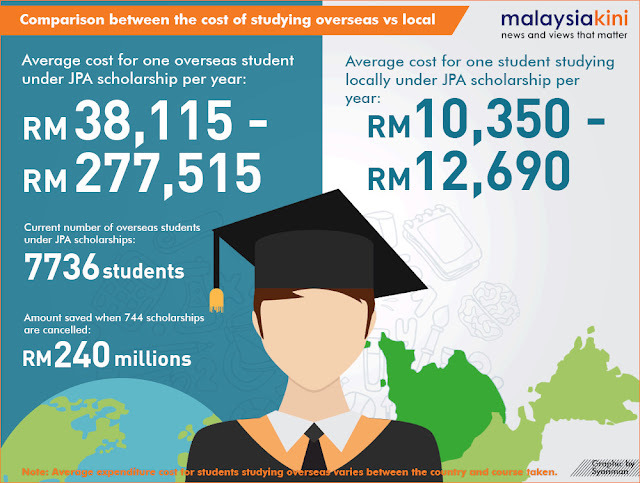 Really terrible news to those previously offered KPM bursaries expecting to further study overseas.